In the excitement surrounding the resumption of Saab production (even if at a trickle), we turned up a couple more classic 900s. While these older cars seem to be more in keeping with the soul of Saab, as opposed to some of the rather porcine GM-era cars, their devotion to the cause of great engineering is also partly why Saab is in its current predicament (see Lancia). Failure analysis aside, these make great classic cars, and we have two, presented in no particular order. 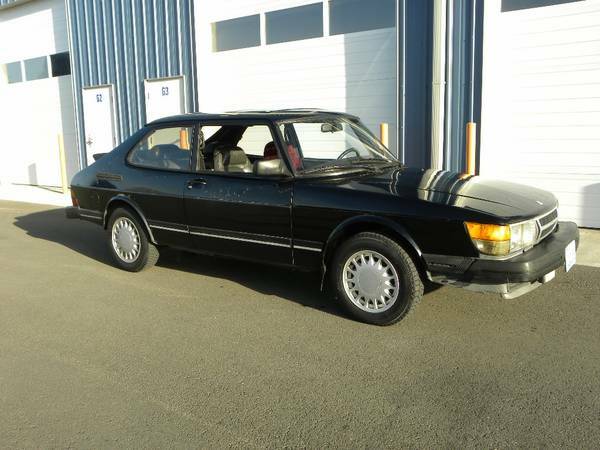 First is this 1983 Saab 900 turbo for sale in Bellingham, WA for $2500. Dark blue is a more unusual color, and this seller has done some nice photography to highlight the strengths of his car. 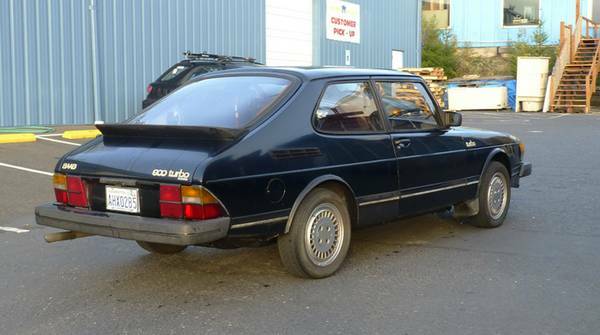 This car has the older-style turbo wheels, early grill with sealed beam square headlights, and probably some other features only the Saabiest among us will know about. As the seller’s daily driver for the last three years, it’s said to be quite reliable. The seller is a multi-car owner who’s run out of space, so there’s hope he’s an enthusiast who felt compelled to take care of getting the car thoroughly reliable. The car is said to need a new clutch slave cylinder soon, but other than that, seems capable of going long distances with no trouble. 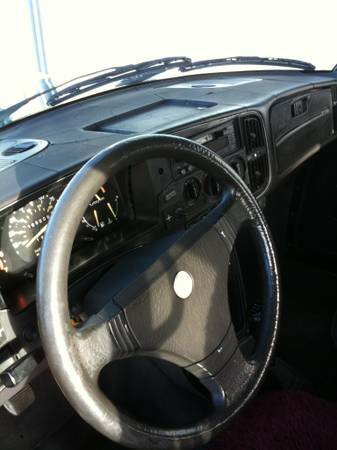 The interior looks to be in good shape, although there is some cracking of the dash, the driver’s seat is not shown, and there’s no mention of the headliner. What is clear is that with the string of garlic hanging from the rearview mirror, you won’t have any trouble getting through the Vampire Apocalypse. 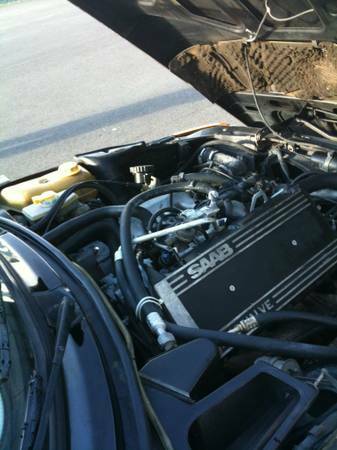 Here’s the one possible shortfall of this car – it’s an 8-valve turbo. However, it does have a recently rebuilt turbo, and the brakes are good and tires fair. 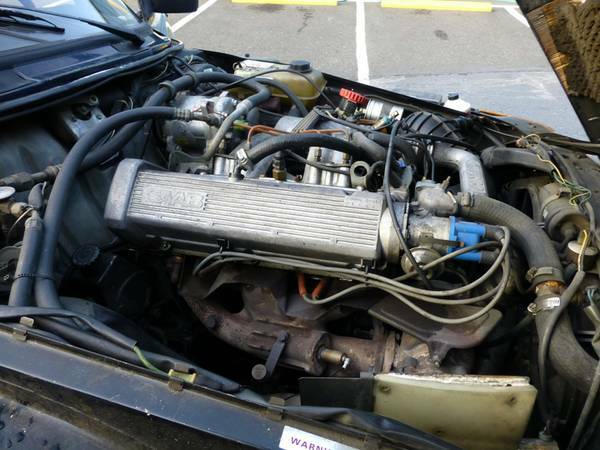 Has anybody tried dropping this engine – maybe just the head and turbo – in a Triumph TR7, or did Saab so substantially re-engineer it that that won’t work (front- to rear-drive conversion aside)? That would be a great surprise at the next British car meet. 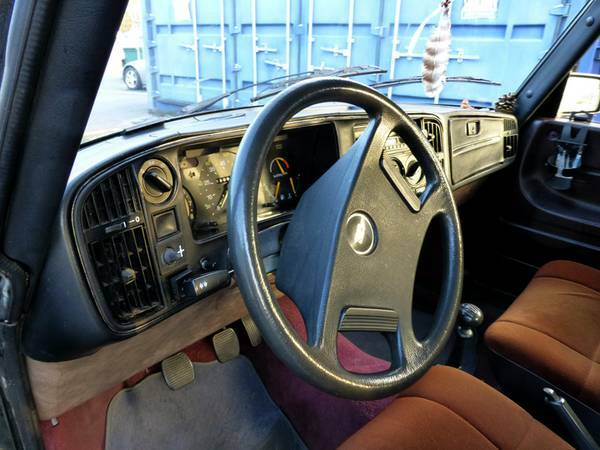 The car is also said to need new paint, although the seller is not specific as to why. In the pictures, it looks decent, but on the internet, pictures are heavy on promises and weak on fulfillment. Most Saabs this age seem to have acquired some dents or rust, so the condition of this one is surprising if it is as it seems. So, you like the condition of that car, but 8 valves of turbocharged Swedish fury is just not enough for you? Here’s a great alternative with a few more miles for less money. 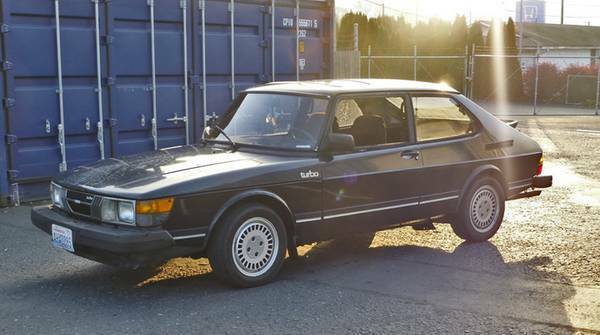 Check out this 1985 Saab 900 turbo for sale just north of the 1983 in Birch Bay, WA, for $2025. This car also looks really good for its age, though its clear coat is failing. Is it possible to simply buff the old paint and re-do the clear coat if you’re operating on a budget? It has a recent trip to Iowa under its belt, and has a history of enthusiast ownership, so that augurs well for its mechanical condition. It’s had a recent service and tires, although those tires look like vintage Michelin Xs – an interesting choice for a performance-oriented car from the 1980s. The dash has similar cracking, and the driver’s seat is covered, so you may have some interior work ahead of you if you’re picky. For under $3,000, both these cars represent great options for carving corners and hauling furniture. This entry was posted on December 4, 2013 at 3:21 pm and is filed under Feature. You can follow any responses to this entry through the RSS 2.0 feed. You can leave a response, or trackback from your own site. Why people keep insinuating (and I suspect none of these people have ever worked on a Saab 99) that the B engine is still a Triumph engine I don’t know. The Ricardo and the B really don’t share much if any parts. Perhaps the crankshaft and that’s it.